Last month I drank a lot of honey and lemon! Even though its typically a drink you have when you are unwell I quite like the combination of flavours and will often have it when I am perfectly fit and healthy too, especially on a cold wintery night. It got me to thinking about flavour mixes that I love – honey and lemon..lemon and rosemary… garlic and well..anything! 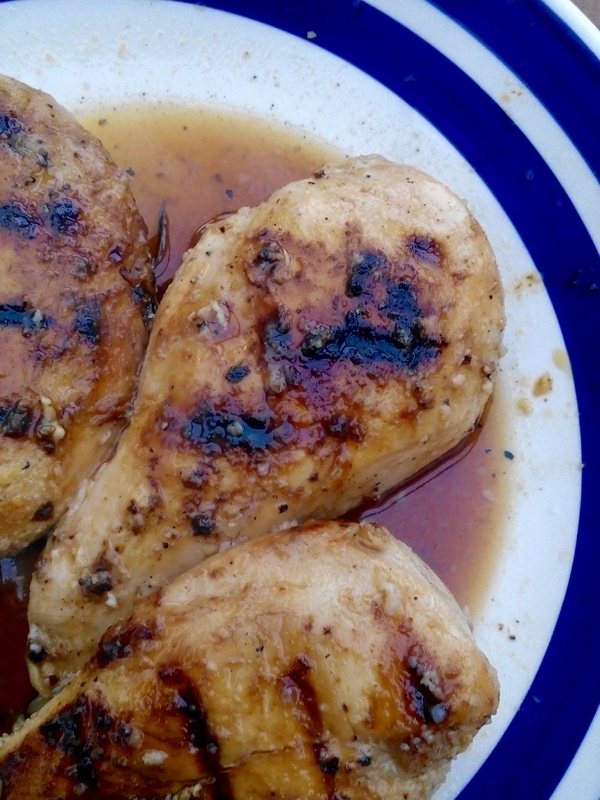 It resulted in this recipe for Slow Cooker Rosemary Garlic Chicken with Honey and Lemon. Slow cooked because I can be a lazy chef at times and I adore my slow cooker. I often don’t even marinate meat that I slow cook as I find it already takes on the flavour well enough but I have in this instance, purely because I had the time. Something about lemons makes me feel like springtime has arrived ( although they fill our fruit bowl year round ) and so it was perfect that this was served on a day where the sun shone brightly in a gloriously blue sky! Although this is a slow cooker dish I popped onto my griddle pan ( a frying pan will do ) at the end mostly for aesthetic reasons but also as I love the caramelisation and taste that it gives. Mix your lemon, 3 tbsp honey, garlic and seasoning in a bowl and add your chicken and mix thoroughly. Refrigerate for a few hours. Remove and leave to bring to room temperature then add to your slow cooker and cook on low for 5 hours. Pop a griddle pan over a high heat until sizzling, brush your chicken on both side with a little honey and sprinkle over black pepper then briefly pop on your pan until golden brown and sticky. Serve with a large green salad and some new potatoes. These were so good I am making them again later this week, this time to slice thinly and serve in tortilla wraps with a herby mayo. What is your favourite slow cooker dish?? Love the combo – making me hungry! Lemon and honey go so well with chicken and this looks delish. I use my slow cooker a lot but not often for Chicken. Must give this one a try. Not a fan of breasts so it will be thighs for me. Nothing lazy about slow cooking, just means you’re doing your food justice. Love lemons and honey too and even better with a bit of ginger.